• Effect of Model Specification on Valuation of Travel Attributes: A Case Study of Rural Feeder Service to Bus Stop, by Bhargab Maitra*, Santanu Ghosh, Sudhanshu Sekhar Das, Manfred Boltze [paper in English]. • Optimization network for intermodal transport of soybeans in northern Mato Grosso to the port of Santarém, by Paulo Roberto Grossi Dias Morales, Márcio de Almeida D'Agosto, Cristiane Duarte Ribeiro de Souza* [paper in Portuguese]. • Measuring the social costs underlying the current fleet of trucks autonomous national agriculture – a case study: soybeans, coffee and live cattle, by Rodrigo Daniel Caudullo Ronchi, Graziele Araujo Moura*, Carlos Henrique Rocha [paper in Portuguese]. • Efficiency analysis of Brazilian public ports management concerning to the role of port authorities, by Luiz Cláudio Sayão Cortez, Lucas Rebello de Oliveira, Eduardo Ferraz Martins, Igor Rosa Dias de Jesus*, João Carlos Correia Baptista Soares de Mello [paper in Portuguese]. • Accessibility in the Amazon region through the water transportation, by Andréa Vaz Morgado, Licínio da Silva Portugal, Andréa Justino Ribeiro Mello* [paper in Portuguese]. • Does investment in surface transport cause economic growth? A quantitative study, by Francisco Gildemir Ferreira da Silva, Francisco Giusepe Donato Martins*, Carlos Henrique Rocha, Carlos Eduardo Freire Araújo [paper in Portuguese]. • Analysis of the potential integration of cycling with public transport in Belo Horizonte, by Catarina Miranda Sampaio e Castro, Heloisa Maria Barbosa*, Leise Kelli de Oliveira [paper in Portuguese]. • Commuter aircraft choice using a modified borda method using the median, by João Erick de Mattos Fernandes, Luiz Flávio Autran Monteiro Gomes, João Carlos Correia Baptista Soares de Mello, Silvio Figueiredo Gomes Júnior* [paper in Portuguese]. • The impact of thermal comfort in the perceived level of service and energy costs of three Brazilian airports, by Jacqueline Elhage Ramis*, Emmanuel Antonio dos Santos [paper in English]. • Four-step model applied for freight transportation planning, by Cristiane Duarte Ribeiro de Souza*, Márcio de Almeida D'Agosto [paper in Portuguese]. • Simulation modelling to analyse the current level of utilisation of sections along a rail route, by Clare Woroniuk, Marin Marinov* [paper in English]. • Price effects of airline alliances – design and modelling, by Cayami Schultz Chiovitti Cavalcante* [paper in English]. • Aviation war risk insurance and its impacts on US passenger aviation, by Paul J. Freitas* [paper in English]. • Econometric analysis to estimate the impact of holidays on airfares, by Helena Póvoa*, Alessandro V. M. Oliveira [paper in English]. • Intelligent transport systems and regional digital convergence in greece, by Theodore Tsekeris*, Charalambos Tsekeris, Konstantinos Koskinas, Michael Lavdas [paper in English]. • A model for estimating airline passenger trip reliability metrics from system-wide flight simulations, by Lance Sherry* [paper in English]. 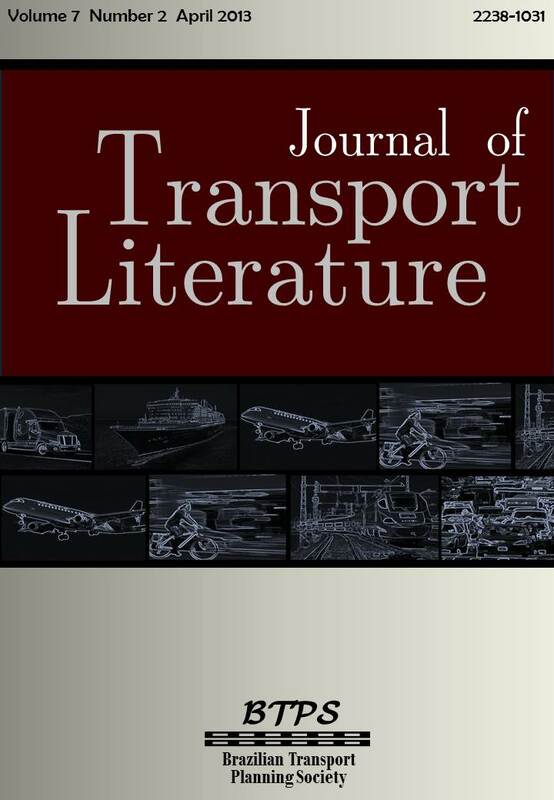 • A supply-demand study of practice in rail logistics higher education, by Marin Marinov*, Anna Fraszczyk, Tom Zunder, Luca Rizzetto, Stefano Ricci, Mirena Todorova, Anna Dzhaleva, Kiril Karagyozov, Zlatin Trendafilov, Jörn Schlingensiepen [paper in English]. • Risk assessment in airlines stocks market, by Renato Cesar Sato* [paper in English]. • Assessing the effects of the são paulo's metropolitan beltway on residential land prices, by Vladimir Fernandes Maciel*, Ciro Biderman [paper in English]. • Driver and vehicle type parameters’ contribution to traffic safety in UAE, by Sharaf A. Alkheder*, Reem Sabouni, Hany El Naggar, Abdul Rahim Sabouni [paper in English].